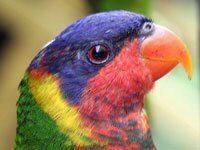 Originally Lorikeets are found in coastal areas around Australia. Now you can find them all around the world, as Lorikeets are kept as pets. There are six different species in Australia and they are all kept in captivity. 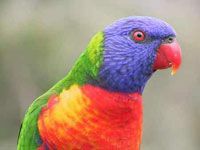 The most common Lorikeets are the Scaly-breasted Lorikeet and the Rainbow Lorikeet. It is illegal to collect Lorikeets in the wild. What does a Lorikeet look like? Lorikeets are small to medium sized parrots. Lorikeets come in various different colors depending on their species. They are very colorful birds with red, yellow, orange, blue, purple and green feathers. They are slender with a long tail. They have brush-tipped tongues they use to feed on fruits and nectar. Where does the Lorikeet live? The Lorikeet's natural habitat is the rainforest. Lorikeets live in the subtropical or tropical moist lowland forests of Australia. They wander and fly to places where they can find food. They can fly very long distances. In the wild Lorikeets are mainly seen in small groups of up to ten but most frequently live as single pairs. In their native habitat, the have an excellent food supply from dense rainforest. 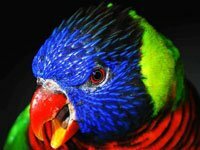 What does a Lorikeet eat? Wild Lorikeet eats pollen and nectar from eucalyptus. They like to eat fruits like apples, berries and pears; they also eat insects, seeds and grubs. Until the introduction of the honey-bee, they were the main pollinators of the eucalypt forests. 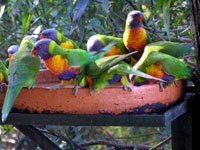 Did you know about these Lorikeet facts? 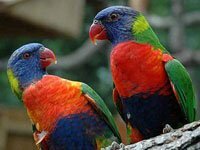 The Chattering Lory and the Moluccan Lory are said to have the best speech. Lorikeets are rather small and only weigh a tiny 130 grams. 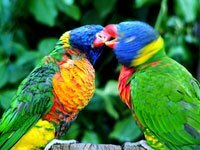 There are 53 species of lorikeets and about 32 sub-species of the Rainbow Lorikeet. Download free Lorikeet wallpapers, click on the image to open the large version. Print free Lorikeet coloring pages, click on the image to open the large version.